In 1912, with some fanfare in the Vancouver press, Emily set off alone on a momentous six-week trip, going through Alert Bay, to the Tsimshian villages of the coast of northern mainland British Columbia, to the Gitxsan villages in the interior, and ultimately to the even more remote settlements of the Haida people on an archipelago then called the Queen Charlotte Islands, now known as Haida Gwaii. "There were many fine totem poles in Cha-atl — Haida poles, tragic and fierce. The wood of them was bleached out, but looked green from the mosses which grew in the chinks, and the tufts of grass on the heads of the figures stuck up like coarse hair. The human faces carved on the totem poles were stern and grim, the animal faces fierce and strong; supernatural things were pictured on the poles too. Everything about Cha-atl was so vast and deep you shrivelled up." The art chronicles of her journey were made using pencil and watercolor. Her art took on bright hues and bold brushstrokes of the Fauvist paintings she saw in Paris in 1910. Emily Carr was born December 13, 1871 in Victoria, British Columbia. She moved to San Francisco in 1890 to study art after the death of her parents. In 1899 she travelled to England to deepen her studies, where she spent time at the Westminster School of Art in London and at various studio schools in Cornwall, Bushey, Hertfordshire, and elsewhere. In 1910, she spent a year studying art at the Académie Colarossi in Paris and elsewhere in France before moving back to British Columbia permanently the following year. She lived in France in 1910 where the work of the Fauves influenced the colourism of her work and she came into contact with Frances Hodgkins. Discouraged by her lack of artistic success, she returned to Victoria where she came close to giving up art altogether. Carr was most heavily influenced by the landscape and First Nations cultures of British Columbia, and Alaska. 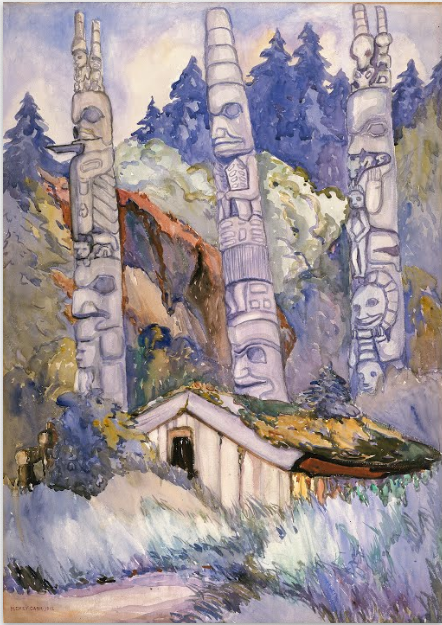 Having visited a mission school beside the Nuu-chah-nulth community of Ucluelet in 1898, in 1908 she was inspired by a visit to Skagway and began to paint the totem poles of the coastal Kwakwaka’wakw, Haida, Tsimshian, Tlingit and other communities, in an attempt to record and learn from as many as possible. In 1913 she was obliged by financial considerations to return permanently to Victoria after a few years in Vancouver, both of which towns were, at that time, conservative artistically. Influenced by styles such as post impressionism and Fauvism, her work was alien to those around her and remained unknown to and unrecognized by the greater art world for many years. For more than a decade she worked as a potter, dog breeder and boarding house landlady, having given up on her artistic career. However, her contact with the Group of Seven in 1930 resurrected her interest in art. A unique Canadian genre and cadre of artists entirely unknown to her, notably the Group of Seven. She met Arthur Lismer, A.Y. Jackson and Lawren Harris. Harris was to have a profound influence and their friendship endured for the rest of her life. Throughout the 1930s she specialized in scenes from the lives and rituals of Native Americans. She also showed her awareness of Canadian native culture through a number of works representing the British Columbian rainforest. She lived among the native Americans to research her subjects. Many of her Expressionistic paintings represent totem poles and other artefacts of Indian culture. She died March 2, 1945 and is interred in the Ross Bay Cemetery in Victoria. Our Sponsors this month are Studio Marcy, Hollowlogy and Areto. One entry will be picked by the editors on the 28th of each month for a free month of advertising on the Art Bead Scene. Bead entries have to be pinned by the 27th of the month. • The Monthly Challenge Recap with Blog Tour will be posted on January 30th. • Winners will be randomly chosen from all the qualifying entries on February 1st. I am so glad that a piece by Emily Carr was selected this month...I was introduced to this amazing woman's work only a few years ago on a visit to Victoria, BC. She is also an author and I highly recommend The House of All Sorts, about the many years she was a landlady...very direct, yet poignant...a time when she had all but given up on her art.